Our ClipsShop brand of European self-piercing grommets and washers are made in a variety of colors and finishes from high-quality solid brass. Most are in stock and available for fast delivery. In addition to our large selection of stock grommet finishes, our self-piercing grommets can be produced upon request in almost any PMS color with an extended lead time and a typical production minimum of 10,000 sets for smaller grommet sizes and 5,000 sets for larger grommets. Contact us today for details on how to order custom-colored, self-piercing brass grommets. NOTE: Solid brass grommets will not rust or stick to a magnet. If your existing metal grommets stick to a magnet then they are only brass plated steel and they will rust. Buy top-quality, European-made brass banner grommets from stock at www.METALgrommets.com/catalog — your source for the highest quality, solid brass grommets in the widest range of standard and custom colors and sizes. Our self-piercing grommets are designed to function optimally with our specially-designed setting dies, producing outstanding results on a wide range of materials and products, including vinyl banners. This combination of integrated grommets and dies enables the grommet-setting machine to pierce the material and set a grommet in a single action without pre-punching a hole. 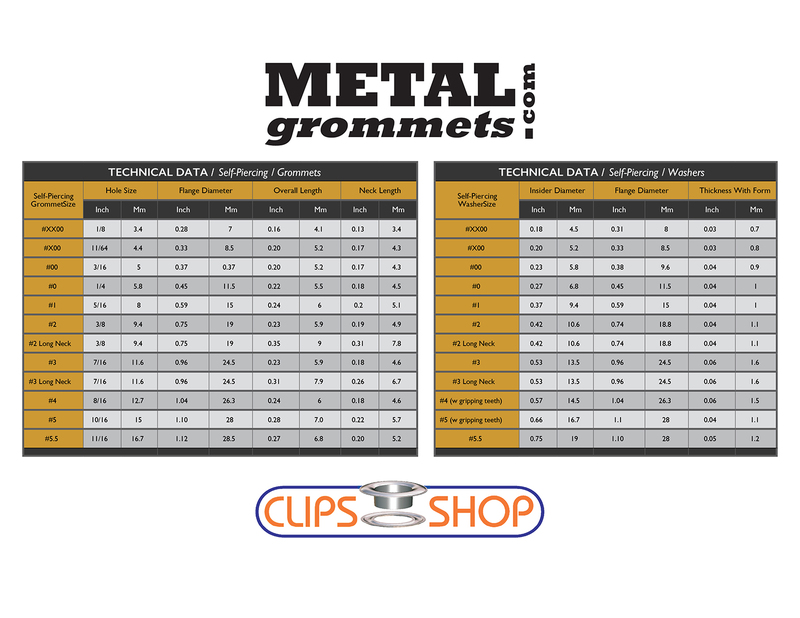 Our ClipsShop solid brass grommets are considered among the highest quality metal grommets available. Whatever your use — from the most contemporary fashion designs to the heaviest-duty industrial applications — METALgrommets.com is your one source for the world’s finest solid brass grommets and fasteners at the lowest possible prices. Please visit our online store today for the widest selection of quality metal grommets at the best prices. *Not all colors listed are available from stock in all sizes. When buying metal grommets, check our catalog to see which grommet colors and sizes are stocked. ** Hole size after setting slightly varies depending on the thickness of applied material. *** Actual dimensions may vary from the above figures slightly due to production tolerances.